and use of program evaluation. learn and develop in the workplace (Elder, 2009; Norris, 2009). mance and stakeholder career satisfaction (Norris, 2006). program performance and stakeholders (Byrnes, 2008). credits are awarded the Language Proficiency Diploma. training teaches of Arabic as a second and foreign language. guage learning strategies, and psychology of language learning. tively correlates with career development in the workplace. indicators of program effectiveness (Lynch, 1996). more desirable way” (Kelchtermans & Vandenberghe, 1994: p.
career (Carr & Kemmis, 1986; Schön, 1983). developments (Bernhardt, 2006; Patton, 1990; Sullivan, 2006). for innovation and ownership of programs” (Byrnes, 2006: p.
program evaluation process (Byrnes, 2008; Gorsuch, 2009). ion, & Morrison, 2011; Lester & Lester, 2010; Sapsford, 1999). about the value of program evaluation. between program evaluation experiences and career satisfaction. same respondents (Coakes & Steed, 2007; Gall et al., 2006). Gall et al., 2006; Shawer, 2012). better than other research strategies (Clarke, 1999; Patton, 1990). relate at a .05 level of significance. administration interval period was about 20 months. ing a narrative (Kvale, 1996). (maximum possible responses) × 100). tion about their career and the program evaluation process. able to cope with the extra workload. career satisfaction was not accepted. 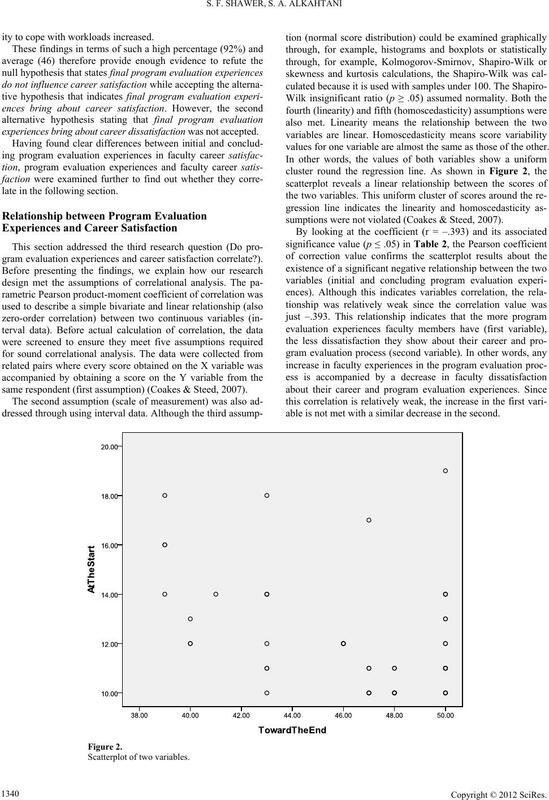 Descriptive statistics (initial and final program evaluation experiences). ity to cope with workloads increased. experiences bring about career dissatisfaction was not accepted. late in the following section. 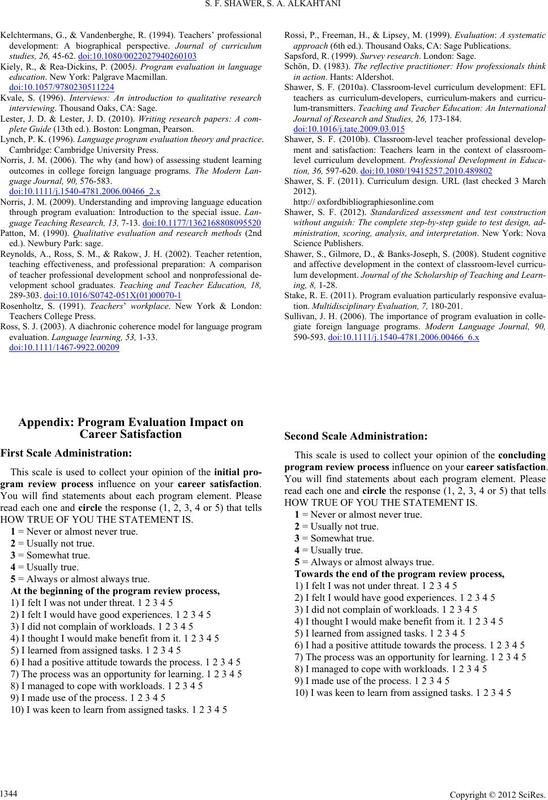 gram evaluation experiences and career satisfaction correlate?). same respondent (first assumption) (Coakes & Steed, 2007). values for one variable are almost the same as those of the other. sumptions were not violated (Coakes & Steed, 2007). able is not met with a similar decrease in the second. Correlation between the two variables. 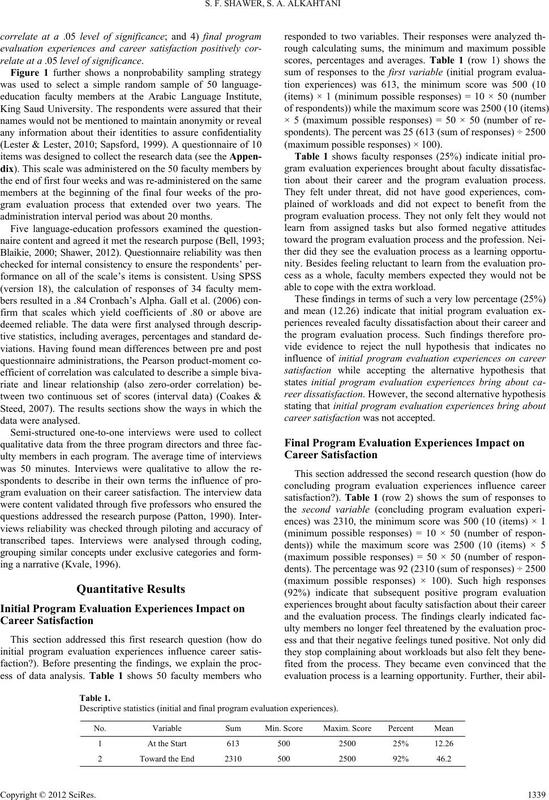 tween program evaluation experiences and career satisfaction. tively correlate) were therefore rejected. tive enough that “I did not expect good from the whole process. We completed tasks without understanding why we did them. cause I have to demonstrate my program deserves to continue. felt what they felt but I was under far more pressure than them. about the outcome of this process, we felt we were in one boat. toward the program evaluation process and the profession. perceive imposed program review as a threat to their career. ance more than being a personal assessment of each member. faculty satisfaction about their career and the evaluation process. ham (2008) and (Chase, 2006). also for institutional, program, staff and student development. in teaching Arabic as a second language. thoughtful teaching. Curriculum Inquiry, 3 1, 217-227. Blaikie, N. (2000). Designing social research . Cambridge: Polity Press. gram outcomes assessment. ADFL Bulletin, 39, 28-30.
edge and action research. London: Falmer. chair’s perspective. ADFL Bulletin, 39, 36-43. Language Journal, 90 , 583-588. Analysis without anguish. Milton: John Wiley & Sons. teacher educators. Teaching and Teacher Education, 19, 5-28.
education (7th ed.). London: Routledge. evaluation consultant. 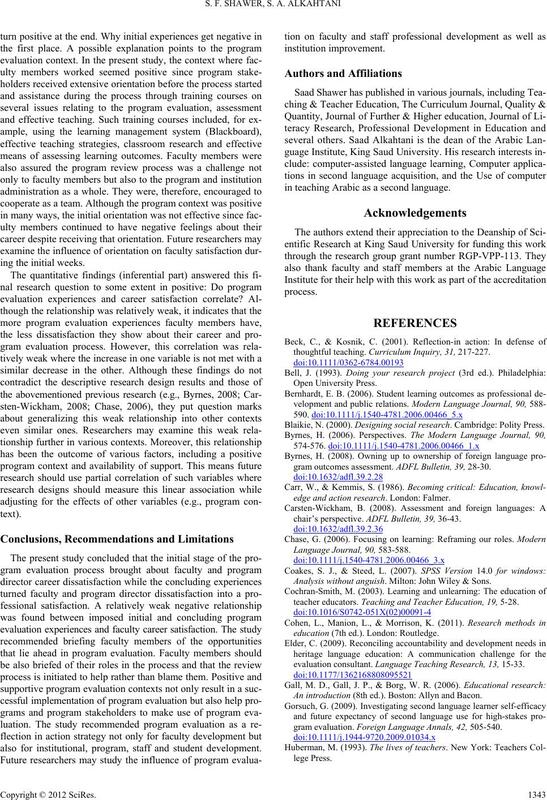 Language Teaching Research, 13, 15-33. An introduction (8th ed.). Boston: Allyn and Bacon. gram evaluation. Foreign Language A nnals, 42, 505-540.
education. New York: Palgrave Macmillan. interviewing. Thousand Oaks, CA: Sage. plete Guide (13th ed.). Boston: Longman, Pearson. Lynch, P. K. (1996). Language program evaluation theory and practice. evaluation. Language learning, 53, 1-33.
approach (6th ed.). Thousand Oaks, CA: Sage Publications. Sapsford, R. (1999). Survey research. London: Sage. Journal of Research and Studies, 26, 173-184.
tion. 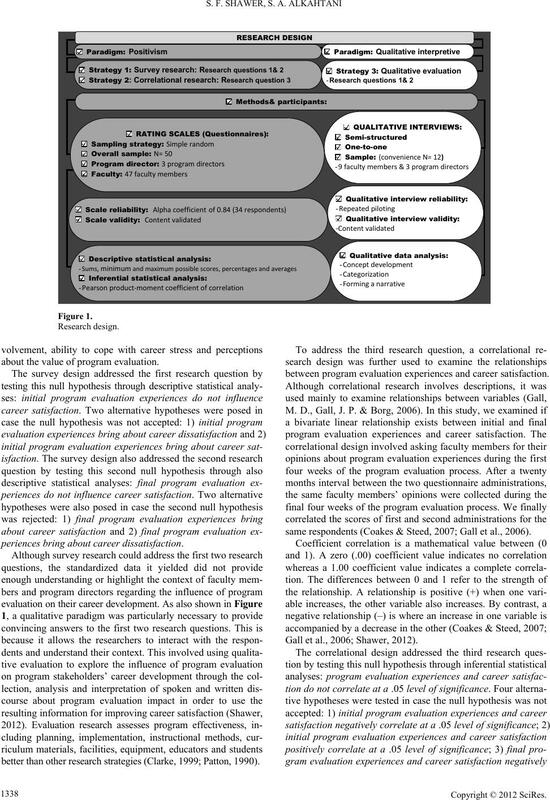 Multidisciplinary Evaluation, 7, 180-201.
gram review process influence on your career satisfaction. HOW TRUE OF YOU THE STATEMENT IS. 1 = Never or almost never true. 2 = Usually not true. 5 = Always or almost always true. program review process influence on your career satisfaction.